Thirteen days ago, Roger Daltrey walked off of the Ford Amphitheatre stage, shaking his head in frustration, unable to sing the first song of that night’s scheduled concert due to illness. 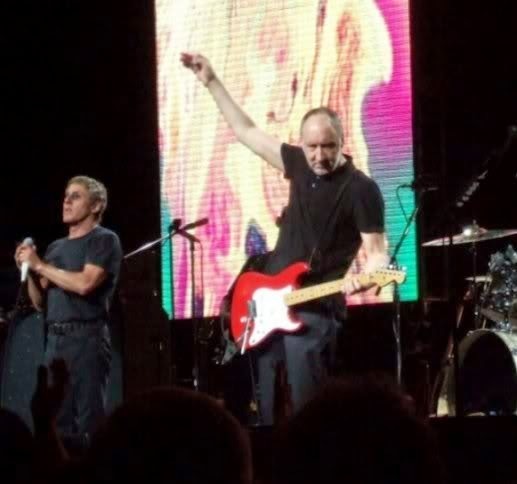 Last night, The Who returned to make up the gig, big time. Armed with guitar, Pete Townshend surged into the opening riff of “I Can’t Explain,” setting Daltrey up to deliver the vocal goods. This time, the voice held up. The mightiest warhorses, “Who Are You,” “Baba O’Riley,” and “Won’t Get Fooled Again,” predictably received the most rousing of responses, elicited not only by the anthemic quality of the songs, but also by the venom Townshend unleashed with his electric guitar. Clearly not over his ailment, Roger Daltrey had admitted early on that his voice would not be at its best, but he offered to the audience, “What I’ve got is yours”. By the end of the night, Daltrey had more than lived up to his word and the Who lived up to their legend.